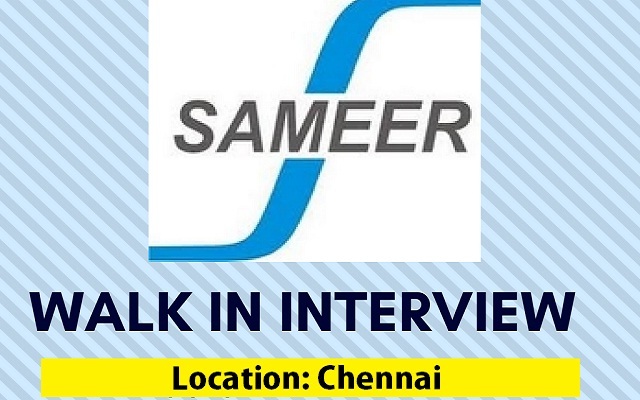 SAMEER Chennai Recruitment 2018 2019 Application Form for 10 Research Scientist, Project Management Assistant-B Posts Download Application through Official website http://cem.sameer.gov.in. SAMEER Chennai Research Scientist Jobs Notification 2018 Released. The Interested and Eligible Candidates are requested to Download Application through Official website. SAMEER Chennai Recruitment 2018 Research Scientist - Apply Now. Project Management Assistant-B - Rs. 30,000 - 38,000/- (consolidated salary).